At least one aircraft was modified to carry a pair of 210MM Wurfgranate (Wgr) 21 spin-stabilized air-to-air rockets in tubes installed on the Wikinger-Schiff (Viking Ship) weapons pylons below the forward fuselage. This was an adaptation of the Nebelwerfer multiple-barrel rocket launcher used by the ground forces. However, the Wgr 21 proved to be too slow for accurate aiming, and was not placed into operational service. A far more satisfactory solution to the problem was provided by the R4M air-to-air rocket designed by Kurt Heber and manufactured byDeutsche Waffen-und Munitionsfabrik at Lubeck. The 55MM R4M (Rakete-4 kg-Minenge-schoss, literally, rocket-8.8 pound-thin-walled shell) contained 17.6 ounces of Hexogen explosive and could cause considerable damage. The trajectory of the R4M was almost the same as that of the MK 108 cannon, and therefore enabled the standard Revi 168 gunsight to be used. A simple wooden launching rack was designed to carry 12 rockets, one rack being mounted under each wing as standard armament on the Me 262A-1 b. The entire battery of 24 rockets were launched within a space of 0.03 second, and scattered to cover an area that would be occupied by a four-engined bomber at a distance of 1,800 feet. Tests were conducted with one Me 262A-1b fitted with 17 R4M rockets beneath each wing, and it was planned to mount as many as 24 per wing for even greater effect. On 18 March 1945, a total of 37 jet fighters were launched against 1,221 bombers escorted by 632 fighters that were attacking Berlin. During this attack the R4M air-to-air rocket was used by the Me 262 for the first time, with devastating results. Twelve bombers and two fighters were claimed by the Germans (the Americans acknowledge only eight of the bombers), with a loss of two Me 262s. A more sophisticated rocket designed by Dr. Max Kramer was the Ruhrstahl X4 which weighed 132 pounds and was 5.95 feet long. The rocket was guided by impulses transmitted from the launch aircraft by means of two wires. The X4 would be launched at a range of 1,000 feet and was equipped with both impact and acoustic fuses. Four X4 rockets were to have been mounted beneath the wings of the Me 262, and some stability tests were conducted with Werk-Nr. 111944 equipped with mock-ups of the rocket. No ‘live’ tests had been conducted prior to the end of the war, primarily because the factory that produced the rocket’s BMW 109- 548 liquid-fueled engine was destroyed by Allied bombers before sufficient quantities had been produced. Other weapons intended for the Me 262 in its bomber interceptor role included the 242- pound R100/B5 rocket, which used a warhead consisting of 400 incendiary pellets. Some aerodynamic trials were undertaken by Werk-Nr. 111944 with an R100/B5 mounted on each bomb pylon beneath the fuselage, but none were ever launched. Various alternative or supplementary conventional weapons were also considered for the Schwalbe since the standard quartet of 30MM MK 108 cannon was not entirely satisfactory. This weapon still tended to jam when the fighter maneuvered, a fact which did not please its pilots. 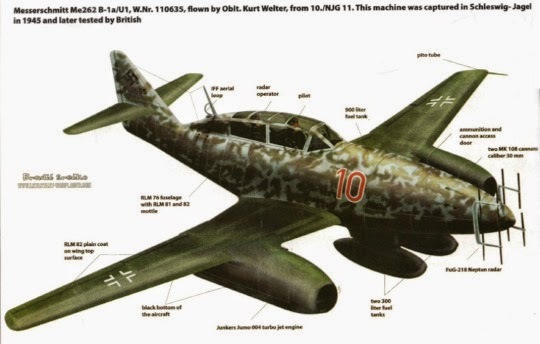 The Me 262A-1 a/U1 featured a nose-mounted armament of two 20MM MG 151 cannon with 146 rounds each, two 30MM MK 108 cannon with 66 rounds each, and two 30MM MK 103 cannon with 72 rounds each. Compared with the MK 108, the MK 103 had a longer barrel, a muzzle brake, and a higher muzzle velocity. The size of the MK 103 and its ammunition feed system necessitated the introduction of a bulged fairing on each side of the fuselage nose. This combination of three different cannon was not adopted as a production configuration, and only three examples of the Me 262A-1 a/U1 were built. The figure of 200 operational Me 262s would never be exceeded by the Luftwaffe. Of the thousand others that had been built, over half had been destroyed by the Allies, many without ever having flown an operational sortie. Another hundred served with units either training to enter combat, or withdrawn from combat for rest. The remainder sat, unused, on railway sidings or airfields. The 55 sorties conducted by Me 262s on 10 April 1945 would mark the greatest number of missions flown in a single day. The Germans managed to destroy 10 American bombers, however, 27 jet fighters, almost half the number which had taken off, were destroyed. By the end of the war, USAAF fighters had shot down almost 100 Me 262s, with the RAF accounting for another 30, and the heavy bombers themselves claiming ten. The lone Me 262A-1a/U2 (Werk- Nr. 170056, V056) had a FuG 220 Lichtenstein SN 2 radar and Hirschgeweih antenna array installed in the nose to test night-fighter concepts. Karl Baur flew V056 equipped with various nose-mounted antenna arrays and vertical blade antennas mounted on the wings to provide information about the behavior of the antennas at high speed, and help engineers determine the most favorable shape and location for the antennas themselves. In addition, the flights were to ensure that the antennas would be able to remain fully functional when the four MK 108 cannon were fired. The aircraft was later assigned to Kommando Welter and used with some success until the delivery of true Me 262B1a/ U1 night-fighters. During February 1945 the FuG 220 was replaced by an experimental FuG 226 Neuling radar, but the aircraft was heavily damaged during a landing accident shortly thereafter, and no serious testing was conducted. During the spring of 1945, yet another unit was formed: the Einsatzkommando Braunegg, a photo-reconnaissance unit equipped with Bf 109Gs and Me 262A-1a/U3s. These were fighter models modified by the removal of armament and the installation of either two RB 20/30 cameras, or one RB 20/30 and one RB 75/30 cameras mounted beside the nose gear wheel well. A glass window was fitted in the cockpit floor to allow the pilot to see what he photographed. A few aircraft managed to retain a single 30MM MK 108 cannon along with the camera equipment. A bulge, similar to the ones used on the Me 262A-1 a/U 1 was fitted to each side of the fuselage to cover the camera’s film magazine. Beginning in January 1945, about 150 Me 262A-l b fighters received a new Askania- Werke EZ 42 computing gunsight, which was the Luftwaffe equivalent of the American K-14 computing gunsight fitted to the P51 D. Unfortunately, it did not function nearly as well, and in fact, the sight graticule was normally fixed in position so that it functioned the same way as the old Revi 16B. These Me 262A-1 b fighters also had provisions for carrying 24 R4M air-to-air rockets under the wings, but otherwise differed little from the Me 262A-1 a configuration. 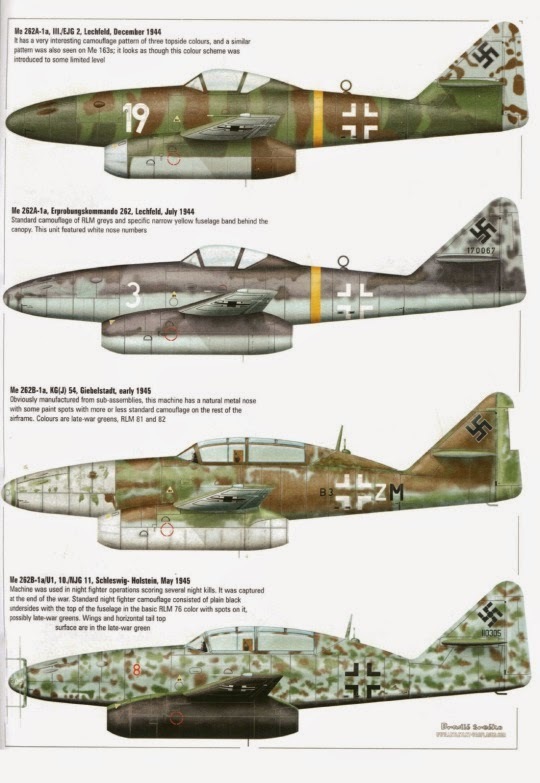 It should be noted that some sources (and many books) list the production Me 262A-1b as either a standard Me 262A-1a or as the Me 262A-1a/R1, and assign the Me 262A-1b designation to a never-built BMW 003A powered production aircraft similar to V078. It is believed that this is incorrect, and the proper designations are presented here. A lone Me 262A-1b (Werk-Nr. 170078), also known as Me 262V078, was flown by Karl Baur and Gerd Lindner during December 1944 in an attempt to flight qualify the BMW 003A-1 engine. The results showed that this powerplant was still inferior to the Jumo 004 used in production aircraft, but that it nevertheless held great promise. In fact, the short flight test program went through four different BMW engines, all being replaced due to various failures. Production aircraft would continue to use the Jumo engine, although development of the BMW engine continued.